The settlement of Polynesia is one of the most baffling human achievements. Did the ancestors of the Polynesians reach the far-flung islands by chance? Were they blown out to sea by a storm and then lucky enough to wash up on remote flyspeck islands like Tahiti, Easter Island or Hawaii? Or were the Polynesians the premier navigators of the ancient world, transportation geniuses who built and sailed sturdy, ocean-going canoes for hundreds or thousands of kilometers without the benefit of so much as a compass or a sextant? Did they repeatedly travel the Pacific on trading missions? Over the last 50 years, the accidental explanation has gradually been sinking under the weight of evidence for deliberate exploration and travel. The notion that the Polynesians knew how to sail across vast distances will get a big boost from today's announcement that stone tools from the Tuamotu atoll bear the unmistakable hallmarks of sources on remote islands. The 1976 voyage of Hokule'a is shown on the map. 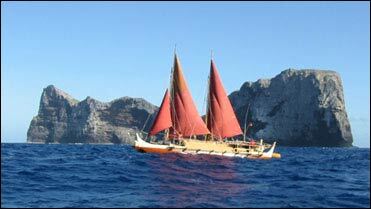 Hokule'a passed near the Tuamotus, where a stone tool that originated in Hawaii was found. One of the tools came all the way from Hawaii, which is 4,040 kilometers (almost 2,500 miles) to the north! We phoned Ben Finney, an emeritus professor of anthropology at the University of Hawaii, who has long argued that the Polynesians were phenomenal navigators. Finney welcomed the new study as confirming those navigational skills, and stressed that the huge size of Polynesia makes these accomplishments all the more impressive. To envision the area occupied by people of Polynesian descent, Finney suggests drawing an imaginary triangle between London and Kamchatka, Russia, and Mysore, India, then sprinkling it with a few small islands. When you consider that many of these islands, including the Tuamotu atoll, are hard to see because they rise only a few meters above the water, you get some grip on the navigation problem. Although there is a long oral tradition of voyaging through the Pacific in Polynesia, there is no evidence of any navigational instruments, such as compasses or sextants. An adze is used to hollow out logs in woodworking. Notice how the stone adze blade was fitted into the handle and lashed with coconut fiber. Image courtesy Jane Willcock, Anthropology Museum, The University of Queensland. The new study looked at stone adzes, woodworking tools that resemble small hoes that were used to hollow out trees to make canoes. The adze heads, made of a rock called basalt, had been collected more than 70 years ago on the Tuamotu atoll. Atolls are low-lying, ring-shaped islands. Because atolls were built by countless generations of coral, they contain no stone aside from dead coral, so the tools must have come from elsewhere. To determine the source of the basalt, earth scientist Kenneth Collerson, and anthropologist Marshall Weisler of the University of Queensland (Australia) extracted a small sample from 19 adzes and measured the elements and isotopes. Basalt is volcanic, but Weisler and Collerson found that the basalt in the adzes did not match basalt from volcanoes around New Guinea or New Zealand, which are located where the ocean bottom dives under the continental plates. This meant the adzes could not have reached Tuamotu with the original settlers, who arrived in Polynesia from the south and west. So where did the basalt originate? A tell-tale signal from the ratio of the elements barium and thorium in the sample, which was similar to rock in the Hawaiian Islands and the island of Ra'iatea in the Society Islands. These basalts, formed when molten rock in the mantle rose through "pipes" in the crust, have a different chemistry than basalt formed further west. Then, isotopes of lead conclusively linked the sample to Hawaii. Several other adzes from the Tuamotus came from islands that, while closer, were still hundreds of kilometers distant. The volcanic rock was probably brought to Tuamotu between 1200 and 1450 AD. Archeologists and anthropologists have long focused on the connections between islands in Polynesia, Weisler wrote us. "Originally this was done by comparing adze styles. Similar styles shared between island groups generally meant these societies were in contact." More sophisticated analytical methods begun in the 1980s could sometimes attribute a particular piece of stone to a particular quarry, but as the search for sources widened, "it became increasingly difficult to unequivocally assign an adze to a source. Our current study, using trace element chemistry and isotopes resolves problems with assigning adzes to a source." The study sets a standard for using stone artifacts to document long-distance migration, Collerson wrote us. "This innovative multi-disciplinary isotope and trace element research provides the first physical confirmation that the truly remarkable extended voyages from Hawaii, documented in the Polynesian oral histories, were possible." Finney says that the new results vindicate those who thought the Polynesians knew what they were doing. In the mid-1970s, to test non-instrument navigation, Finney helped organize the construction of Hokule'a, a traditional ocean-going Polynesian canoe. That voyage, together with subsequent expeditions, "supported the hypothesis that the Polynesians had the technical capability of purposefully exploring and settling the islands of the remote Pacific," Finney told us. "There was not a technical block." The Polynesian migration "did not happen by accident." For years, doubts about the ancient voyaging tradition added to the burden of colonialism in Polynesia, Finney says. Hawaiians and Tahitians "had been beaten culturally, politically, socially. They had gotten the idea from their teachers that Polynesians are sort of dumb. They were the premier seafarers of the ancient world, and they did not know about it." • Stone Adze Compositions and the Extent of Ancient Polynesian Voyaging and Trade, by K.D. Collerson and M.I. Weisler, and Tracking Polynesian Seafarers, by Ben Finney, both in Science, 28 September, 2007.